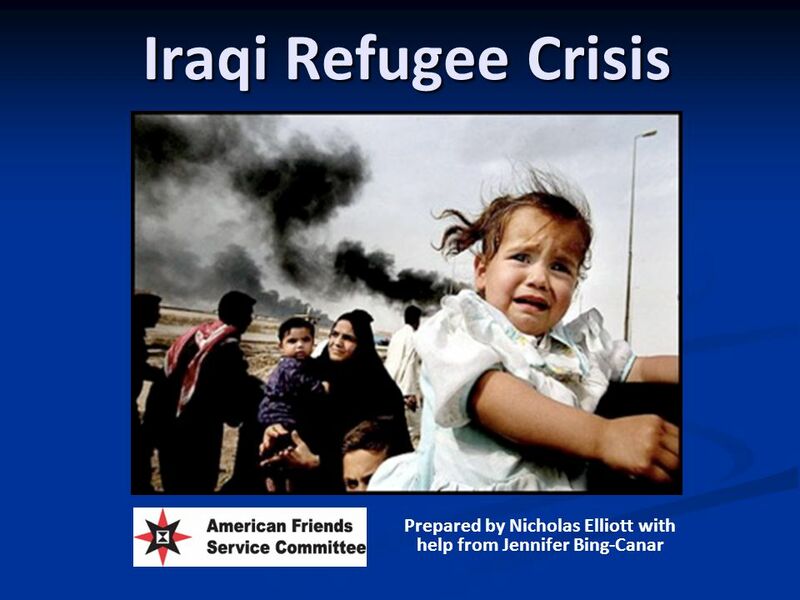 Iraqi Refugee Crisis Prepared by Nicholas Elliott with help from Jennifer Bing-Canar. 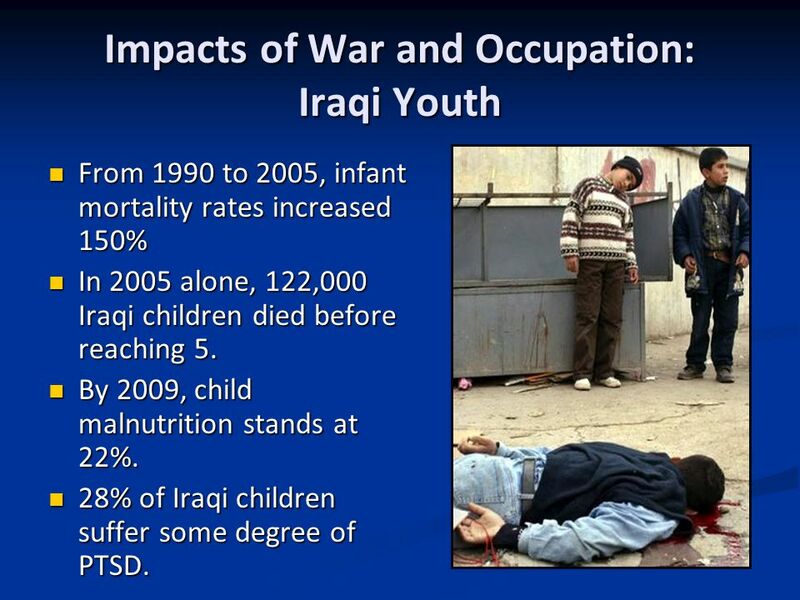 5 Impacts of War and Occupation: Iraqi Youth From 1990 to 2005, infant mortality rates increased 150% From 1990 to 2005, infant mortality rates increased 150% In 2005 alone, 122,000 Iraqi children died before reaching 5. 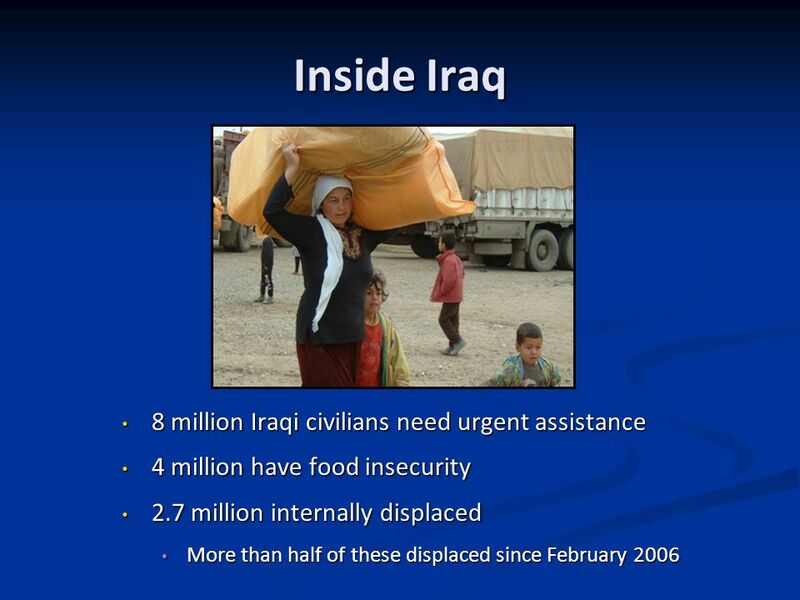 In 2005 alone, 122,000 Iraqi children died before reaching 5. By 2009, child malnutrition stands at 22%. By 2009, child malnutrition stands at 22%. 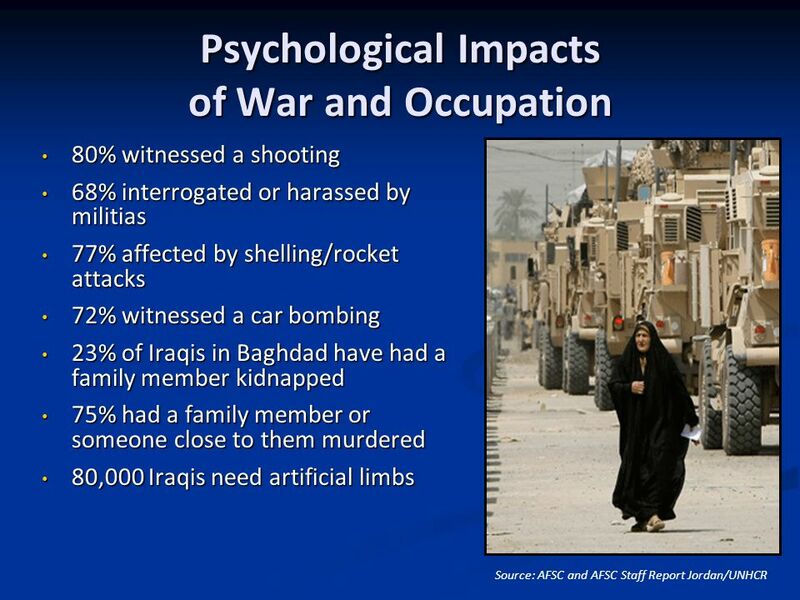 28% of Iraqi children suffer some degree of PTSD. 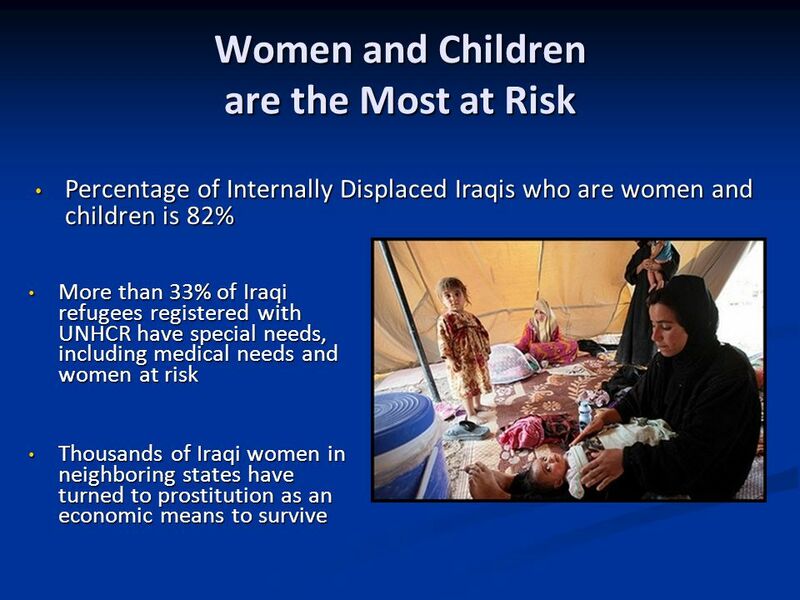 28% of Iraqi children suffer some degree of PTSD. 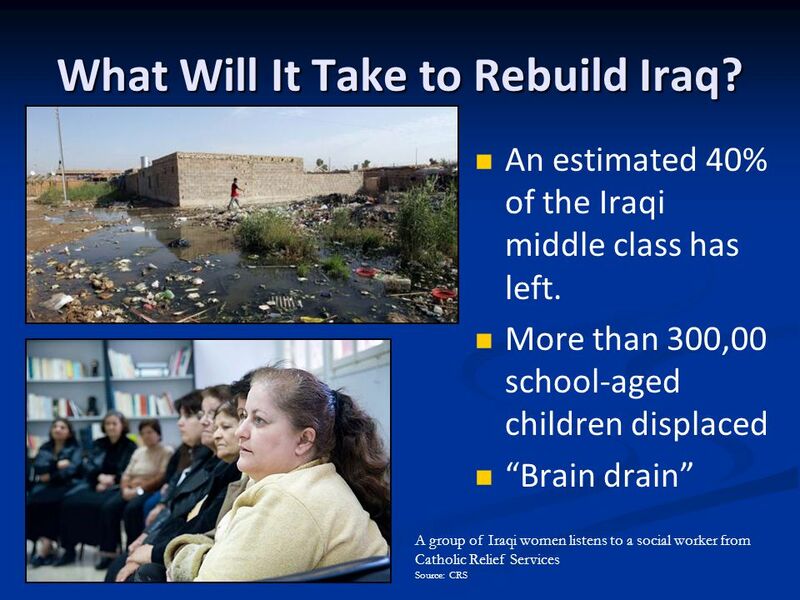 20 Rebuilding: What Will It Cost Iraq? 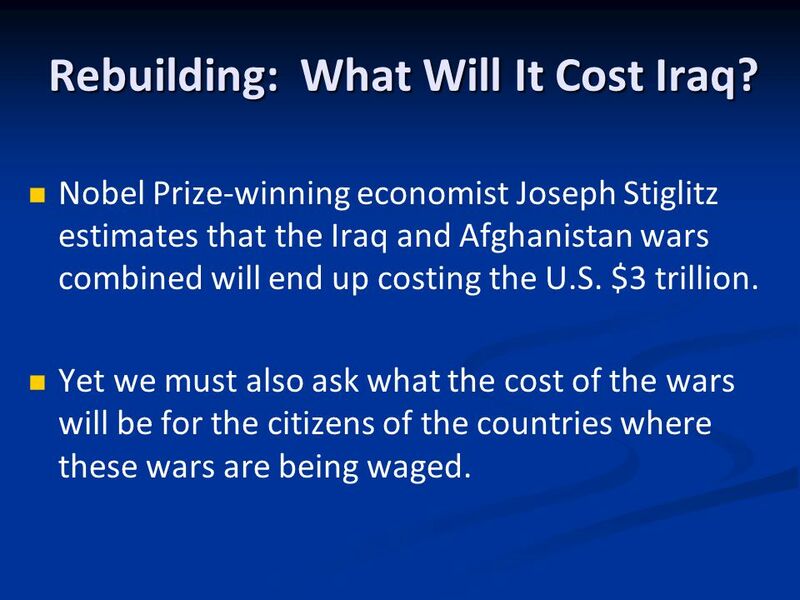 Nobel Prize-winning economist Joseph Stiglitz estimates that the Iraq and Afghanistan wars combined will end up costing the U.S. $3 trillion. 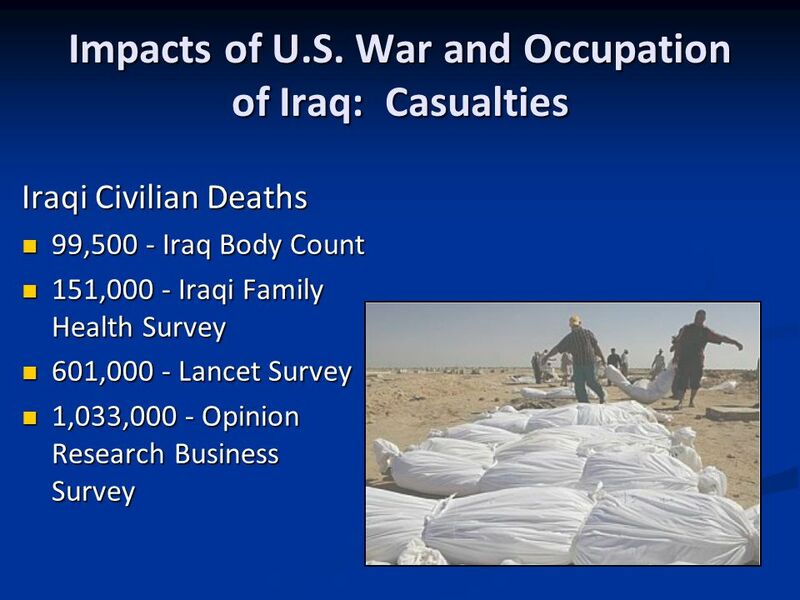 Yet we must also ask what the cost of the wars will be for the citizens of the countries where these wars are being waged. 25 What Can You Do? Be aware of the situation. Check in for the latest news at alternative news sources such as democracynow.org, commondreams.org, alternet.org, directaidiraq.org, and afsc.org. Be aware of the situation. Check in for the latest news at alternative news sources such as democracynow.org, commondreams.org, alternet.org, directaidiraq.org, and afsc.org. Tell others what you have learned. Share it with your friends, family, teachers, and community members. Tell others what you have learned. Share it with your friends, family, teachers, and community members. Extend the hand of friendship. 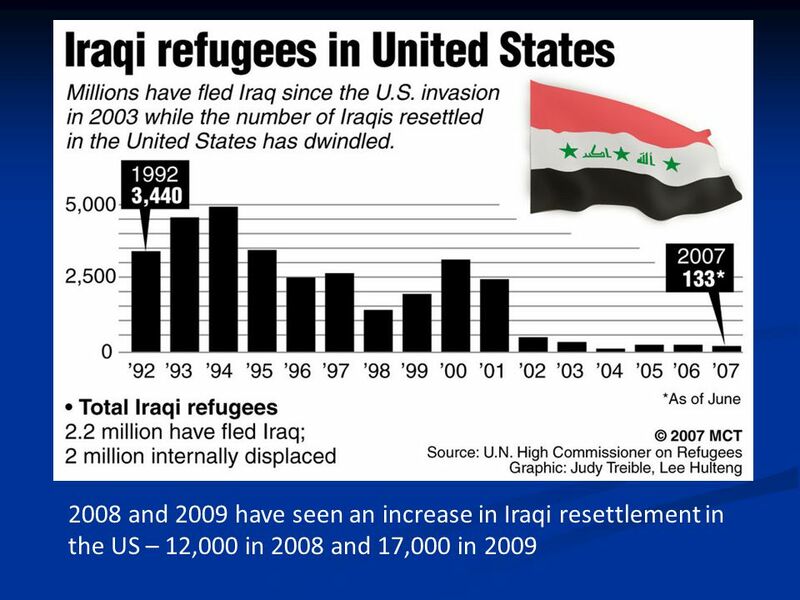 Iraqi refugees are often the target of hatred because they, too, need a share of the limited resources of the communities they are resettling in. 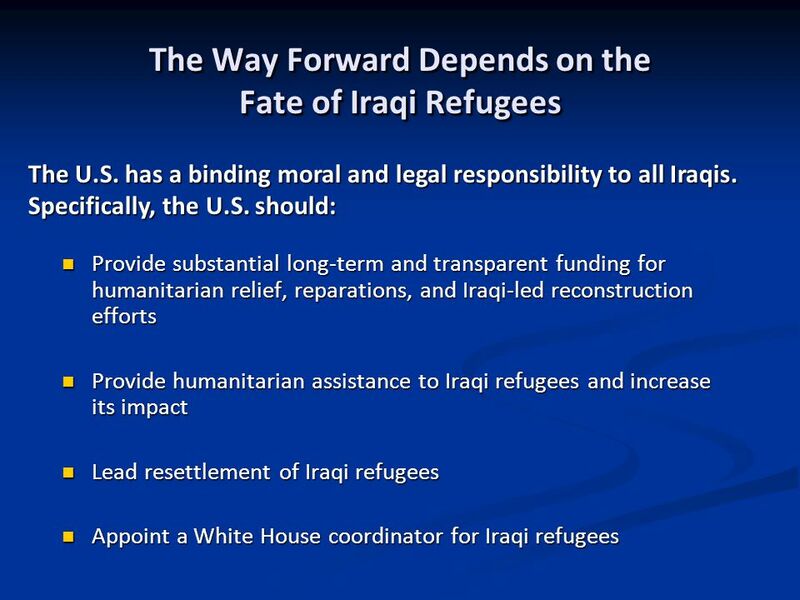 Chances are, the Iraqi population will grow in Chicago and they will need neighbors who understand where they are coming from and are willing to help them out. Extend the hand of friendship. 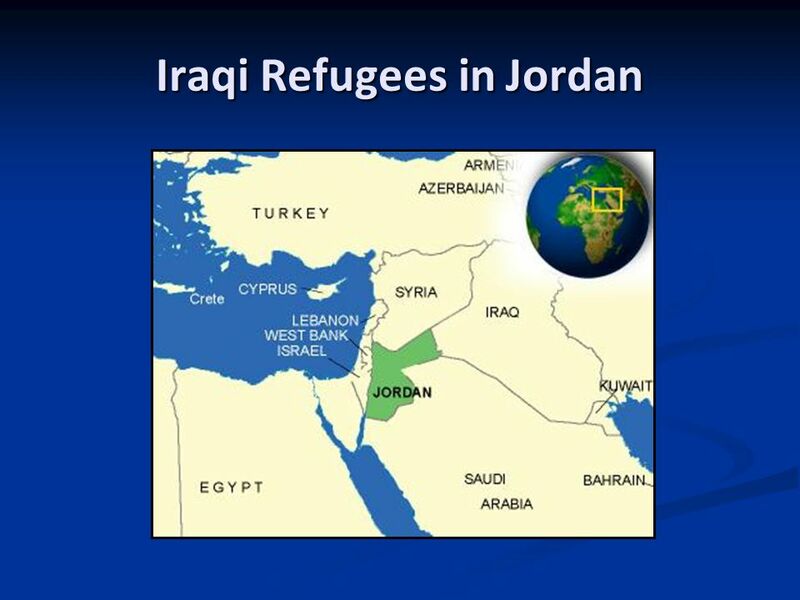 Iraqi refugees are often the target of hatred because they, too, need a share of the limited resources of the communities they are resettling in. 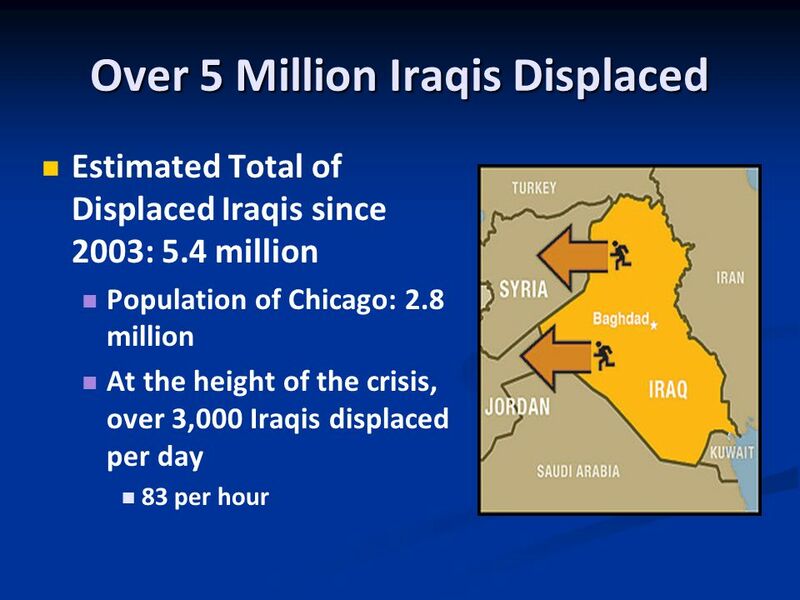 Chances are, the Iraqi population will grow in Chicago and they will need neighbors who understand where they are coming from and are willing to help them out. Volunteer at local resettlement agencies. 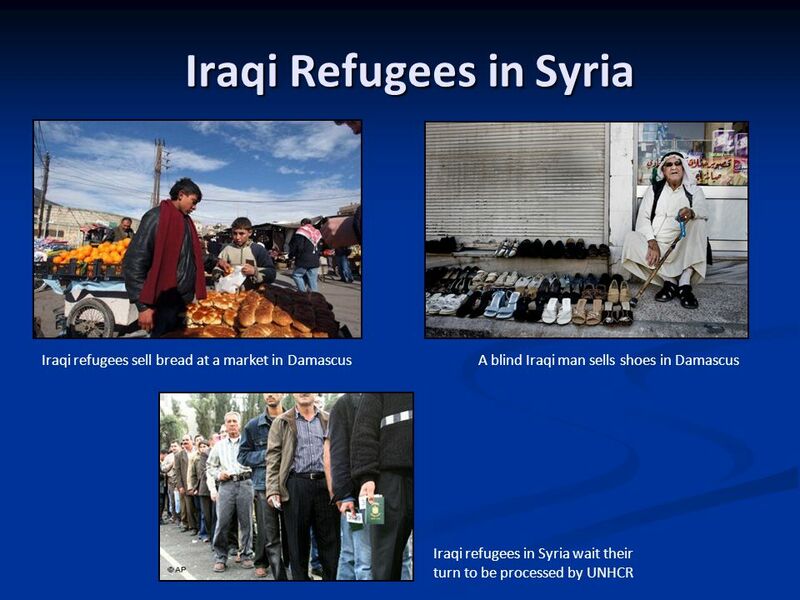 Iraqi refugees have little to their names and need basic necessities like food, clothing, and household items. School age children often need tutoring. Check with the local resettlement agencies like Heartland Alliance, Interfaith Refugee Services, and Catholic Charities. Volunteer at local resettlement agencies. 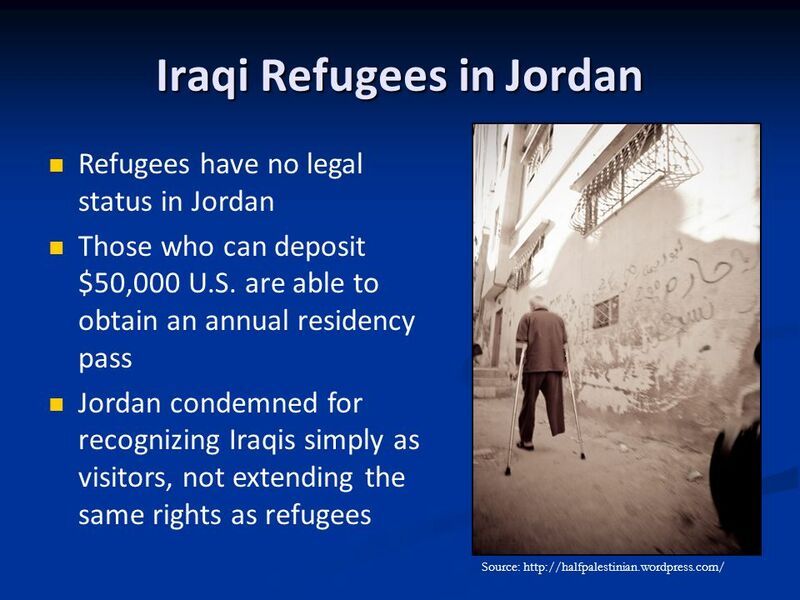 Iraqi refugees have little to their names and need basic necessities like food, clothing, and household items. School age children often need tutoring. Check with the local resettlement agencies like Heartland Alliance, Interfaith Refugee Services, and Catholic Charities. Keep in touch with AFSC! 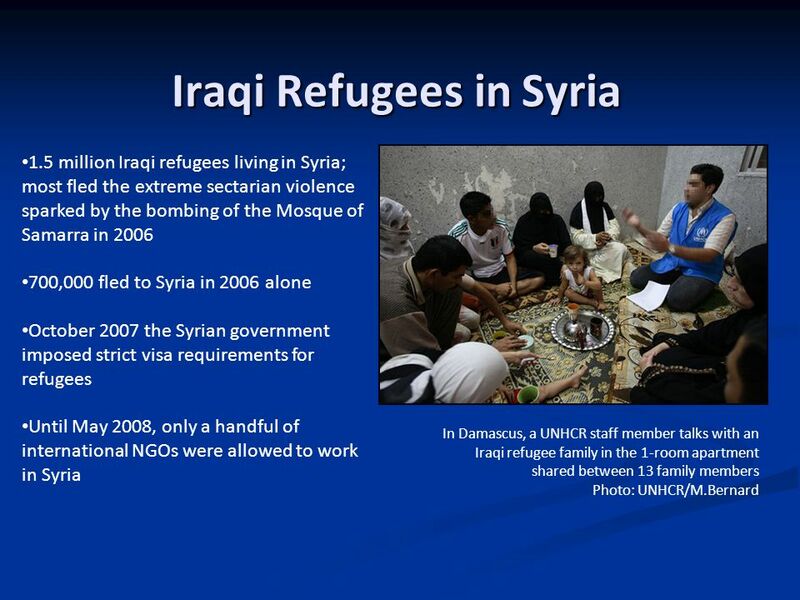 We have lots of resources you can use to advocate for Iraqi refugees in your community. Keep in touch with AFSC! 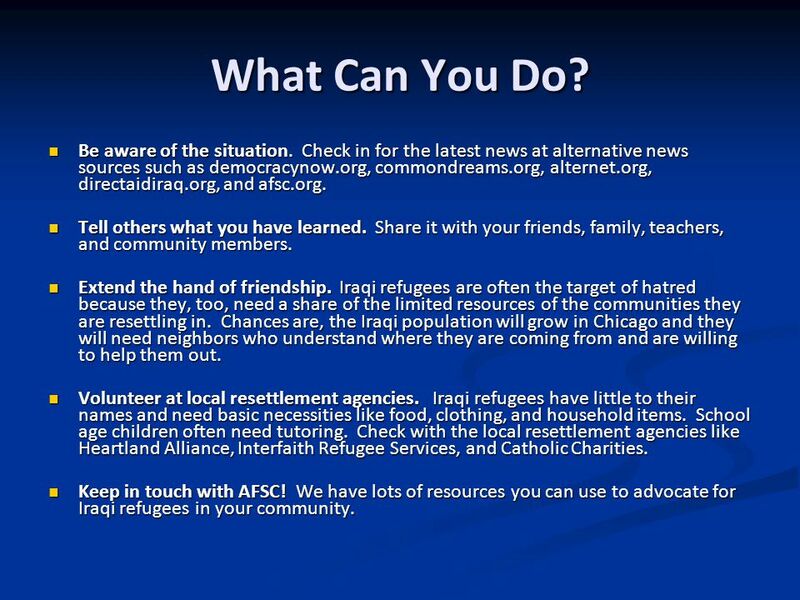 We have lots of resources you can use to advocate for Iraqi refugees in your community. 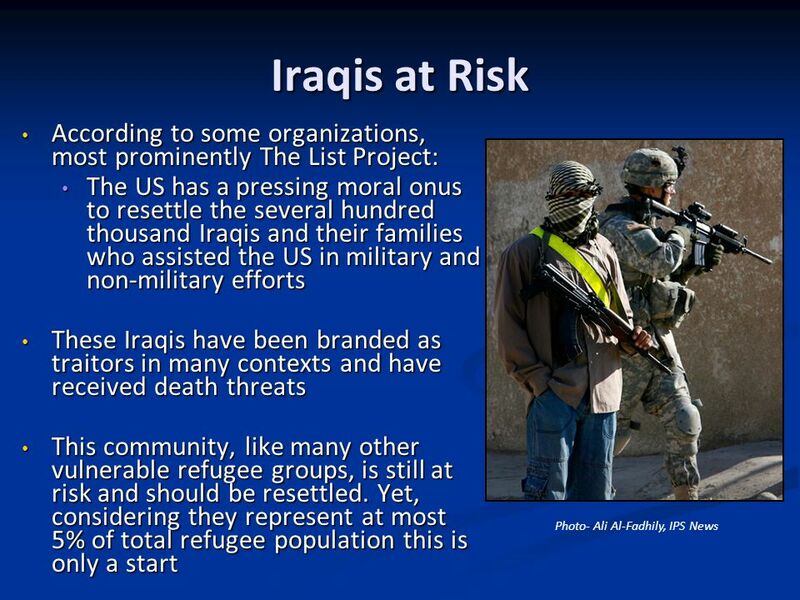 Download ppt "Iraqi Refugee Crisis Prepared by Nicholas Elliott with help from Jennifer Bing-Canar." SYRIA CRISIS APPEAL A Tearfund Prayer Resource Reuters/Majed Jaber During 2012 Syria descended into civil war. To date, 3 million people have been driven. 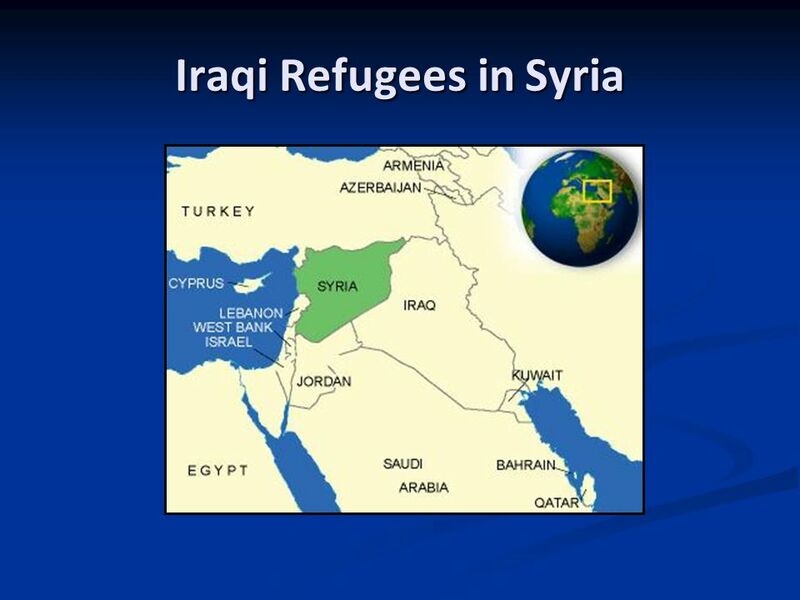 Syria Regional Crisis September Quick stats Over 100,000 killed since March 2011 Over 2 million refugees Over 4.25 million displaced internally. WORLDRELIEFDURHAM.ORG 2014 WORLD RELIEF DURHAM VOLUNTEER ORIENTATION. Equality and Diversity Feedback from the Leicester College Diversity and Equality day 2014. Coordinated Assessment and Information Management Training 4 – 9 May 2014. By Shehak Awan. 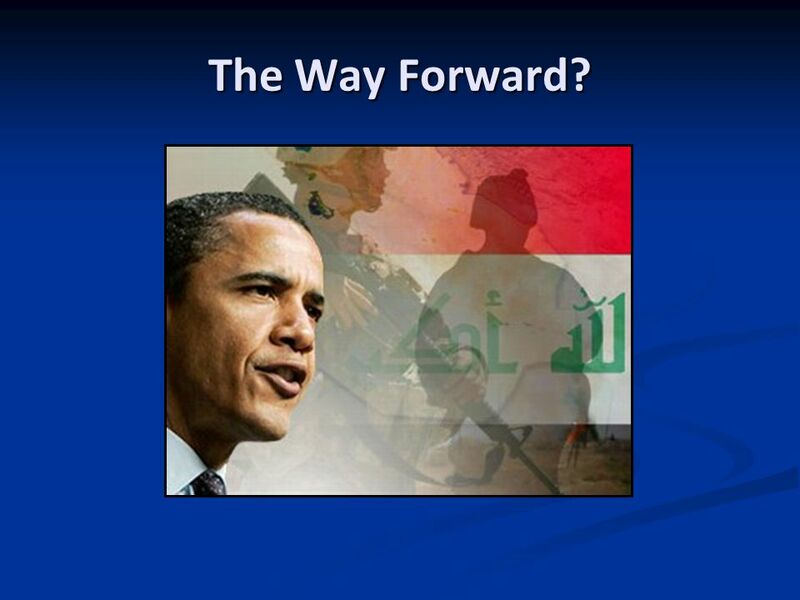 Outline  War  Affect on the people Society Refugees and Casualties Health Education Economy Politics. 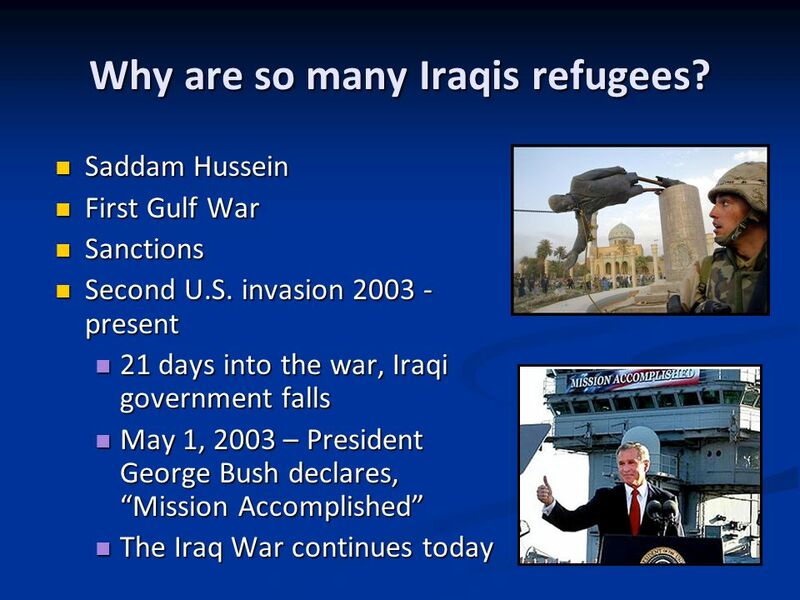 Photo: Refugee Resettlement in the US: An Examination of Challenges and Solutions. Welcome to SOS Children’s Villages. Syria SOS Children have worked in Syria since 1981 There are 2 SOS Children’s Villages: Qodsaya Near Damascus Cares. 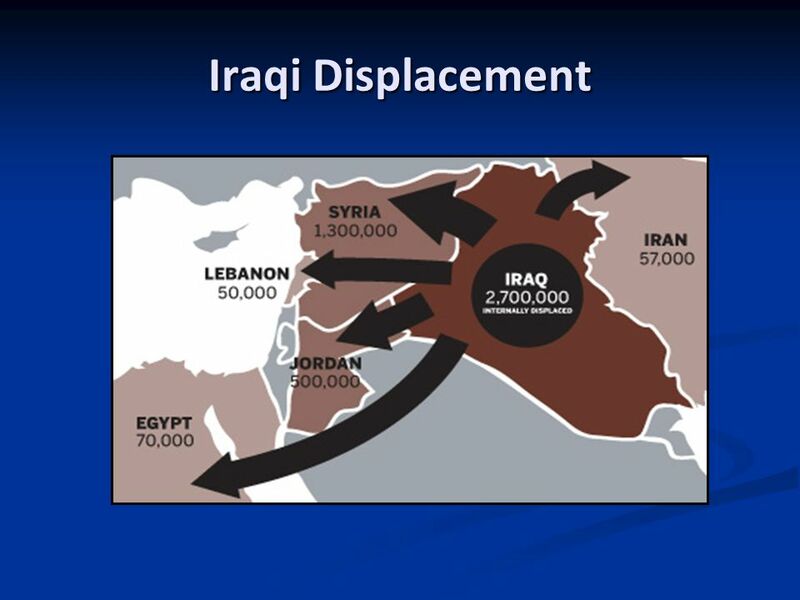 The Impact of Oil and Middle East Wars Lesson 20. 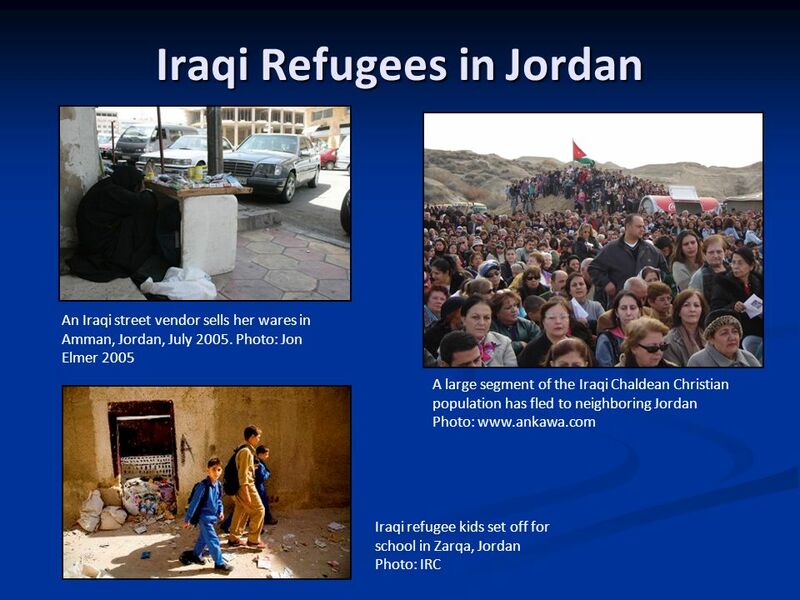 Iraqi refugees in the Middle East Syria, Jordan and Lebanon April 2008. CRS conference 4 September Medact Medact is a charity for health professionals and others working to improve health worldwide  it conducts research. 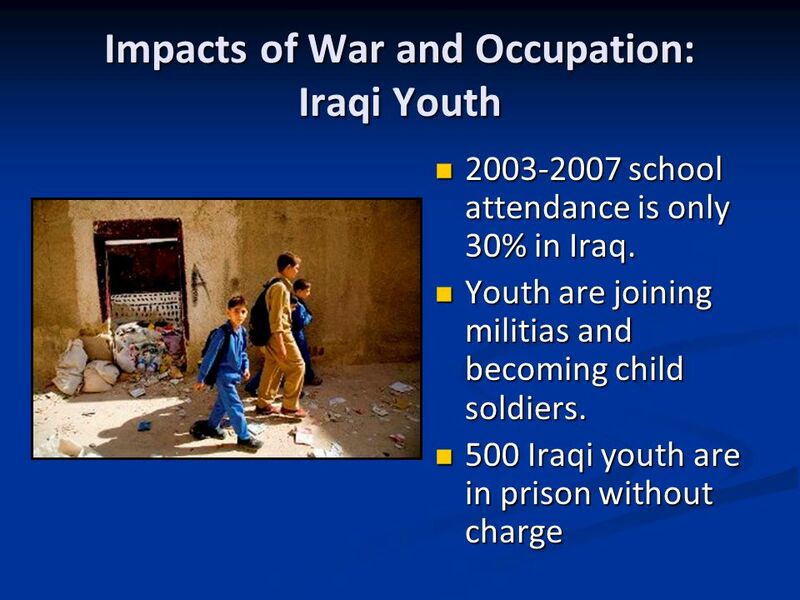 EDUCATION IN IRAQ By David Gring. EDUCATION PRIOR TO WAR  Prior to the mid-1980s, education in Iraq was considered of the best in the Middle East and. 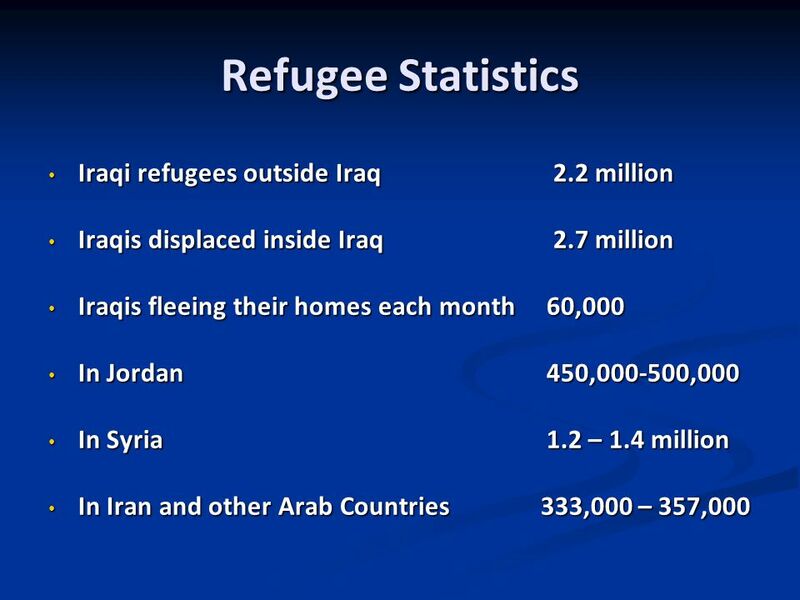 Refugees Year 11 Issue. 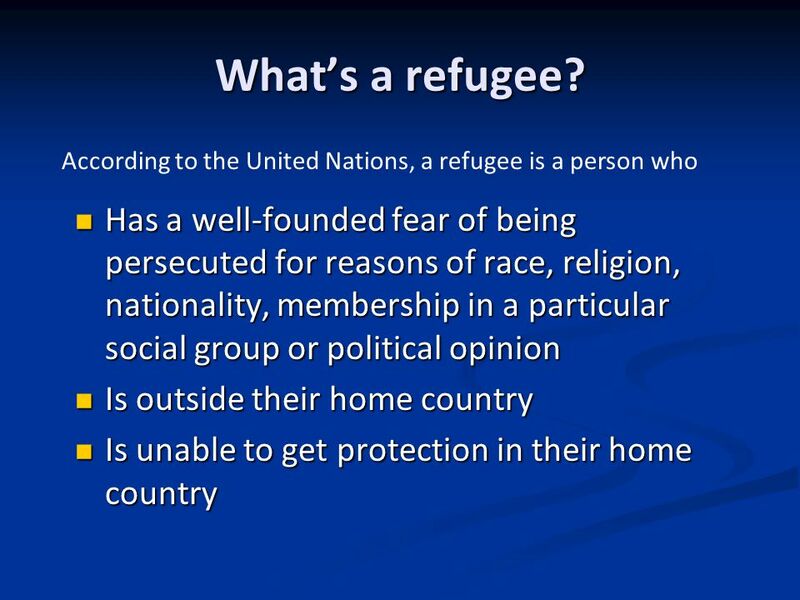 Learning Objective:  To develop a broad understanding of the key terms, ideas and issues associated with refugees and Australia. Car Seat Education for Refugees: Bridging Barriers. Rights of Refugee Women – Victims of Violence Birgit Einzenberger UNHCR Office in Austria – 11 th WAVE.